Relax as Relentless motors you through the Sedge Islands and Oyster Creek Channel. 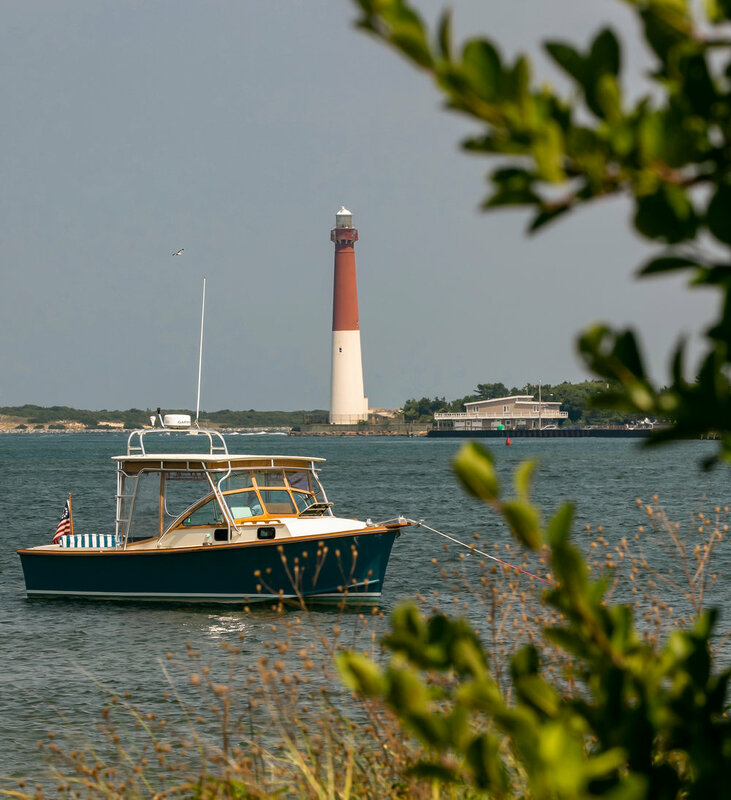 This is a great opportunity for observing wildlife and breathtaking views of the Sedge Islands and preservation lands, Barnegat Light harbor and the historic Viking Village docks. Cool off from the hot summers day with a refreshing dip in the ocean fed inlet. Let Captain Mike hold the wheel as you enjoy the warmth of the sunset on Barnegat Bay. Sip your favorite beer or wine as you cruise through Barnegat Light Harbor and historic Viking Village. The sunset glow deepens as you motor toward the inlet breakers and Ol' Barney Lighthouse to take in her splendor from a unique angle. Relentless is available for half and full day charters. The possibilities are endless as excursions can include down island, up the bay, and picnics! Customize your cruise by electing for a meal at the Captain's Inn across the bay and Relentless can motor you there and back in style. Relentless is a classic New England Cuttyhunk Bass Boat design known for their sea keeping ability and their stable, dry rides. Her draw of 30 inches allows ease of navigation through the shallow waters of Barnegat Bay. Along with her ability to glide through the water, she offers a spacious cockpit perfect for up to 6 guests with the option for sun/weather protection under a fully enclosed custom hardtop. Fortier's are built in coastal Somerset, Massachusetts and have been a highly sought after cruiser for over 40 reputable years. Relentless boasts handmade teak rails, cabinets and accents, making her the most attractive boat in her class. Relentless not only offers a spacious open aft deck but she also features a fully enclosed Captain's cockpit to keep you dry and warm during rain. LBI Luxury Charters reserves the right to postpone the trip up to departure time for safety in times of extreme weather, but tries their best to contact you day of to notify if there is a chance of cancellation. Only in extreme weather situations and your trip cannot depart, you can reschedule. You and up to five of your family/friends are welcome to join Relentless on the water. We suggest a hat, sunglasses and sunscreen (please no spray sunscreen). It is normally 10-15 degrees lower on the water, so bring a sweater or jacket to stay comfortable. Bottled water is available for your convenience. Relentless is a BYOBeer or Wine vessel. Snacks like cheese, crackers and fruit are a great addition to enjoying the views. LBI Luxury Charters can also make catering requests on your behalf. Relentless complies with all USCG and all federal law while on the water. No federally illegal substances are permitted. Captain reserves the right to end trip with no refund if someone becomes too intoxicated or illegal substances are found. Children are encouraged to join you on your day off, however anyone under the age of 12 must be in a life jacket at all times while onboard the vessel per USCG law. It is recommended to bring your own that your child is comfortable wearing for 2 hours.